Summer's back . . . and so is Free Bowling! One simple sign-up, no coupons to be emailed or printed. "Stay and Play" - bowl additional games for just $1.49 each. Also returning this year is the Summer Pass for adults. The Summer Pass is just $34.95 and includes two games per person, per day, for the purchaser plus three adults ages 16 and up. No coupons to print, just bring your membership card or give your name and you're all set to bowl! With 250 locations nationwide, you can find a place near you, near your summer vacation area and near grandma's house. STRIKE it big this summer and SPARE everyone from the heat outside! 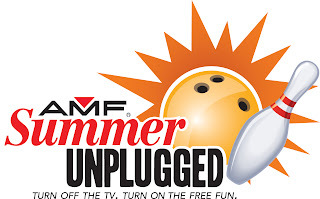 The Summer Unplugged and Summer Pass programs run May 13, 2013 through September 2, 2013. Members can redeem their bowling games every day from open until 8 pm using their membership pass, member ID, first name or other unique identifier. Disclosure: I participated in this campaign as a member of One2OneNetwork and am eligible for a prize drawing. All opinions stated in this post are my own.